Do you enjoy the thrill of a steep hike with amazing views? Do you want your next vacation to be an incredible hiking experience? 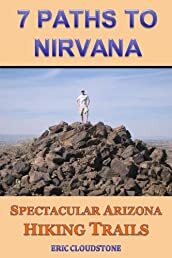 Then "7 Paths to Nirvana – Spectacular Arizona Hiking Trails" is the right book for you! From exhilarating desert mountain trails and a hike up the highest alpine peak in Arizona to exploring the enchanting beauty of the Grand Canyon and the Superstition Mountains, this general travel book explains why Arizona is a great hiking destination and describes my seven favorite hikes in this beautiful state. The trails will immerse you in the stunning scenery of the Sonoran Desert, the Grand Canyon, three national forests, and the Superstition, Red Rock Secret, and Kachina Peaks wilderness areas. Plan your next great trip using this book as a guide and experience a hiking nirvana! -The hikes in the book are rated as strenuous and difficult. -The trail information and maps are general and not usable for precise navigation purposes. -This book contains photos of the trails and wilderness areas.